Murgh Tikka is another of those phenomenal Indian dishes pretty well known all over the world. The Tikkas have made a special place not only in every Indian restaurant but also in the hearts of many non Indian food lovers. 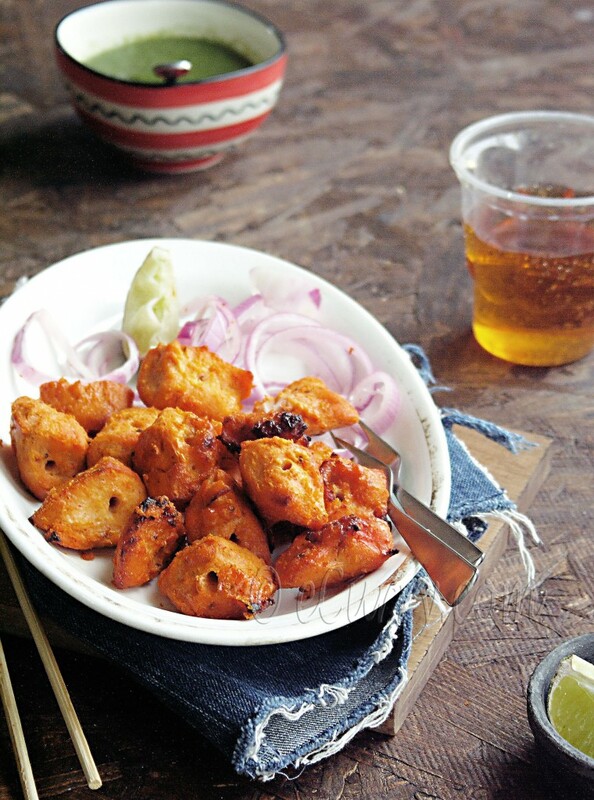 These are the famous tiny bites of meat, (mostly with an orange glow) which are marinated in a blend of fragrant spice mix and yogurt and then broiled in the Tandoor until tender and succulent. We love our Murgh Tikkas, truly with our heart and soul. This is few of those quick recipes which result in the most delicious aromatic chicken, and which may be eaten in a myriad of creative ways. All it needs is a check in the pantry that you have the ingredients and spices for the marinade. The cooking barely takes a few minutes and this is one of those convenient party or backyard barbeque recipes. Murgh is Chicken and Tikkas are the little morsels or bites; having originated in the northern regions of India these are immensely popular as an appetizer and are relatively easy to make. The kebabs and grilled meat in India have strong influences of the Persians and the Mughals, and the Murgh/Chicken Tikka is no exception. The little bites are tender and beautifully flavored. 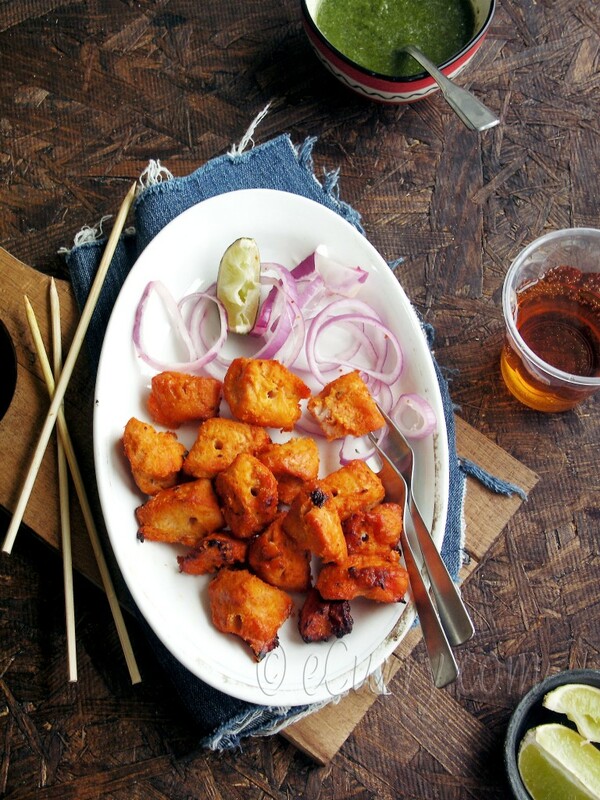 The succulent bites of chicken are usually served on a bed of sliced onions, with wedges of lemon juice and a sprinkle of Chaat Masala. The Tikkas also may be served on a bed of fragrant pulao/pilaf with a side salad and raita or rolled in Parathas or Naan with a spread of chutney – as a wrap. Add them to your salad or in a pita pocket for a quick meal fix. Anyway you have them, they make a delectable and satisfying meal. Keep in mind that this melt in the mouth aromatic morsels should not be confused with the Chicken Tikka Masala. 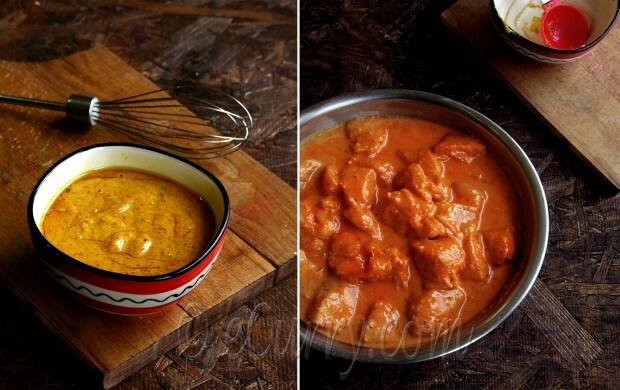 Chicken Tikka Masala is the a creamy spicy curry dish made with the Murgh Tikka. When I was reading through Manisha’s Kebab post, I noticed that she had used the chickpea flour/besan in the marinade and I started using it ever since. It works really well to make the marinade thicker and it clings to the chicken pieces better. The orange hue that these tikkas come in are nothing but food color to have that restaurant style colored glow; I do not use it for our everyday Tikkas and you do not have to use it and not using it will not mess with the taste of the Tikkas. I have used it this time, to have a more authentic look. Below: The marinade (without the food color) on the left, and the chicken marinated with the food color, on the right. Traditionally as the Tikka is cooked in a Tandoor (clay oven), chicken with bones are used too. However it makes it easier to use boneless chicken for conventional ovens and grills. 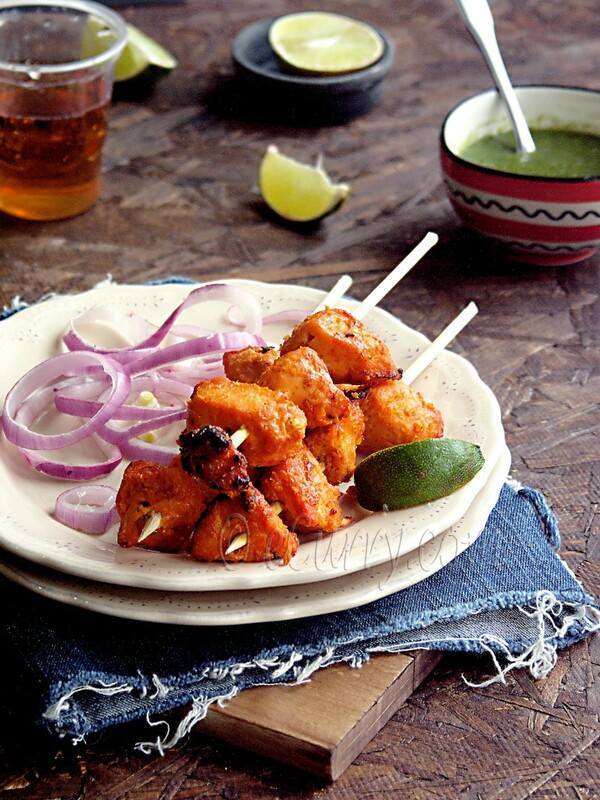 Boneless meat is also easy to skewer; needless to say they are also easy to eat. I have used pure mustard oil here. The mustard oil imparts a different kind of flavor and to some extent a subtle kind of heat as mustard oil has the same sinus opening effect as the wasabi. It is hard to find a substitute for virgin mustard oil. If you do not have the mustard oil, go ahead and use ghee or olive oil. 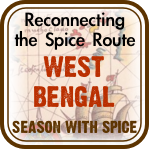 Another not so popular spice is the carom seeds/ajwain that is used here. This again is a spice with very distinct flavor and some spicy heat. Carom seeds/Ajwain is easily available in the Indian grocery stores. Again if you do not find it, skip it. The Murgh Tikka is all about the aromatic succulent grilled chicken and there are no fixed rules. Flavor it the way you want. What I have for you today is the traditional way to do it (sans the Tandoor) and tried to get to the closest authentic taste and flavor. I am not claiming this to be “THE AUTHENTIC”, for I know not the secrets or the magic to it. We love it this way, and it does taste very similar to the ones we love at a few good restaurant. The perfection of the flavors did not happen in one day. It was a long trial and lot of permutation and combination of the ingredients of the marinade; but we finally have here what we heart. If you are using bamboo skewers, you will need to soak them in water for about 20-30 minutes. Use chicken without bones and skin. Cube the chicken breasts into 1 inch cubes. Wash and pat dry. Place chicken cubes in a large non reactive bowl. Add all the ingredients of the first marinade and rub them well into the chicken pieces; let it sit for about half an hour. Heat the 1 tablespoon milk and add the saffron to it. Stir and let it sit. The saffron will release the color and aroma in the warm milk. Heat the half tablespoon of oil in a pan, but not smoking hot. Crush 1 teaspoon ajwain/carom seeds gently by rubbing them with finger in the palm of your hands and tip them in the oil. Add the chickpea flour, and constantly stir it with a wooden spoon at low heat, until it turns a shade darker and you smell that nutty flavor. It might look like the flour is lumping up, but it is okay and keep stirring. I love the nutty taste and flavor of this toasted flour. In a mixing bowl, whisk the yogurt. 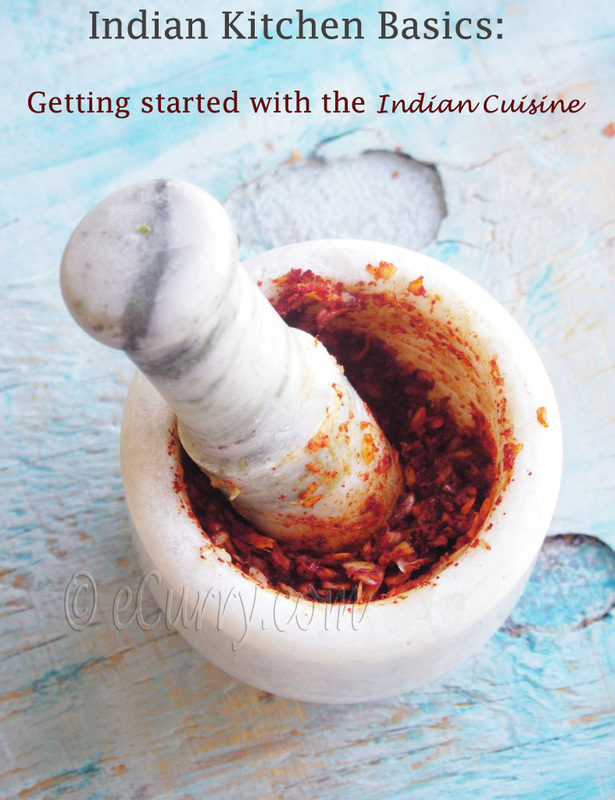 Add the ginger paste, garlic paste, garam masala, 1 teaspoon crushed ajwain/carom seeds, kasuri methi, turmeric, black pepper, red chili powder, salt and the food color you are using. Add the saffron milk. Removed the toasted chickpea flour from the pan and add to this mixing bowl. Whisk everything together until you get a smooth lump free mix. This is your final marinade. Spoon this out in to the bowl with chicken and toss really well so every cube of chicken is coated with the marinade. Let it sit for at least 4 hours; overnight is great. Rub the skewers with some of the marinade so they kind of coat the skewers. Skewer the chicken cubes in the sticks – about 6-8 in each stick. Pre heat oven to about 400 – 420 F (every oven if different, so you might need to adjust/try out the right temperature. I had the temperature at 410F in my convection oven). Place the skewers side by side on a lightly greased tray. Bake for about 10-15 minutes or until they are done and white inside, but still soft and tender. During this cooking time, make sure that you baste them generously with some ghee/oil on both sides and turn them over at least twice. If you want the charred feel and look, broil the chicken for another 3-5 minutes. Cook the skewered meat on the grill; cover for about 5-8 minutes. Uncover, cook until almost done; baste generously with ghee/oil, and turn them over and cook until done. NOTE: Over cooking the meat will toughen it and the pieces will dry out. So do not cook for too long. The meat needs to be just cooked through, soft and succulent. Serve them hot with sliced red onions; drizzle chicken and onions with lemon/lime juice and Chat Masala if you are using. (I use the red onions, but soak them in water for a while to get rid of the heat). They are usually accompanied by the Mint Cilantro Chutney. 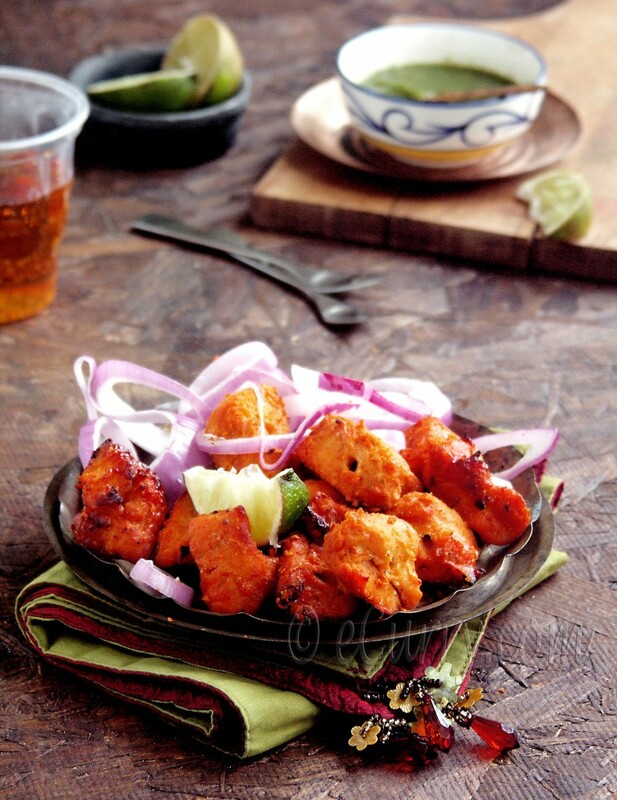 Your Murgh Tikka looks amazing and so mouthwatering! A terrific dish. Oh,this was an eye opener Soma.SO many things,so much of informations.Thank you so moch.And what classic clicks boy,am just drooling over.Brilliant job for sure ! Kill me now. This looks SO HAWT! Oh goodness, what a lovely chicken dish. Loving it over here!! Oh gurrrrrrrrrrl can Jonathan and I come over for dinner?! Geez these chicken kebabs looks mighty delicious!! Interesting tip from Manisha. Pics look fantastic. This looks so flavorful — I gotta make this for the boy :). So delicious! 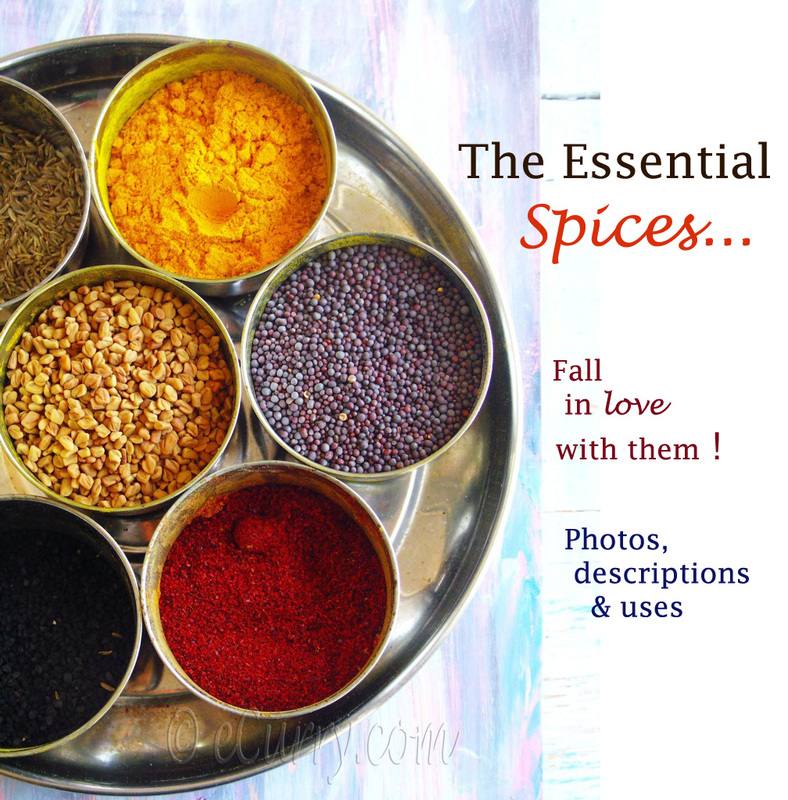 I love the touch of ajwain in your tikkas! This looks fantastic. Thanks for the recipe and great photos! Mmmm, Soma, these skewers are perfect for the spring/summer weather that’s approaching! We have bbq’s along the river in a park by our house. I think I’ll whip up a few of these for our picnic this weekend (and let you know how they turned out of course). This is one of our favorite saturday nite meal which hubby cooks over the grill while I relax with some drinks 🙂 Seriously, nothing can beat a perfectly cooked spicy chicken ! 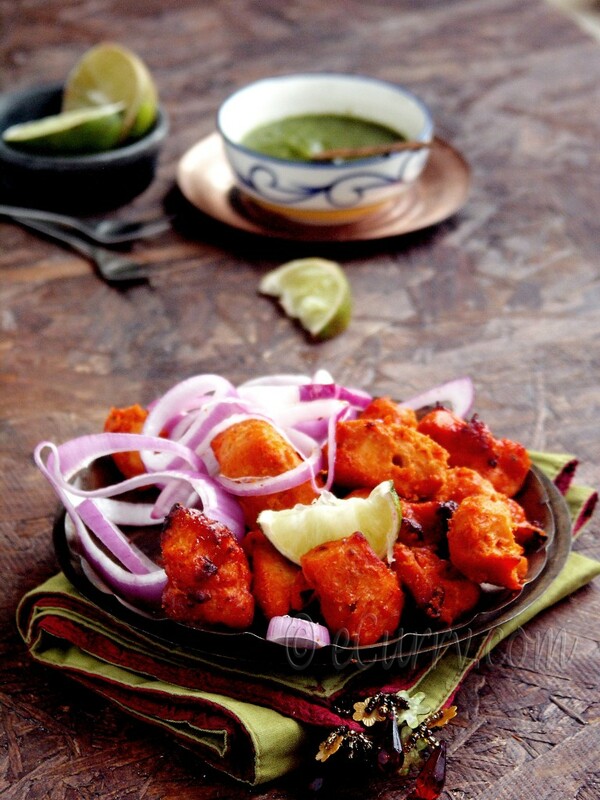 Your chicken tikka looks amazing. Is ther eany substitute for Gram flour? could I use all purpose flour instead? I might just found the answer to why my tikkas always become dry and chewy. I have never used substitute for the gram/chickpea flour. But I have made the tikka without using it. The flour just helps the marinade to stick to the pieces better which in turns adds to more flavor. I have never used AP flour, so I cannot tell for sure… the tikkas usually get dry/chewy due to over cooking, or less marination. A good marination (plus tenderizing agents like yogurt and lemon juice), prepares the chicken for minimal cooking time. Not sure if I could help. No problem. I found a well stocked pakistani market which also sells the Chick pea flour. I even found the Ajwain seeds (the package says Tyme/tymol seeds). Was marinating with some tips and hints i got from a bangladeshi chef, and decided to not try and substitute with all purpose flour as the Chick pea flour gave a really nice nutty aroma. What also turned out to toughen the meat slightly was to bring it down to room temperature. leaving the chicken in room temperature for 1-2 hours helped a lot (health rules say that meat should be no more than 2 hours in room temp). The tikkas were first cooked on the inside at about 180 C for about 10 min, and then broiled for 3 more min. The kashmiri red chili powder and paprika gave them a slightly red color. A indian chef named Harpal Singh Sokhi also uses the binding technique involving chick pea flour, Ajwain and oil. 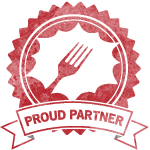 hey happen to see ur blog while surfing for bbq cuisine….myself being a ardent bbq fan,found the receipes intersting.would definately try them for some interesting results in my enzos bbq grill. 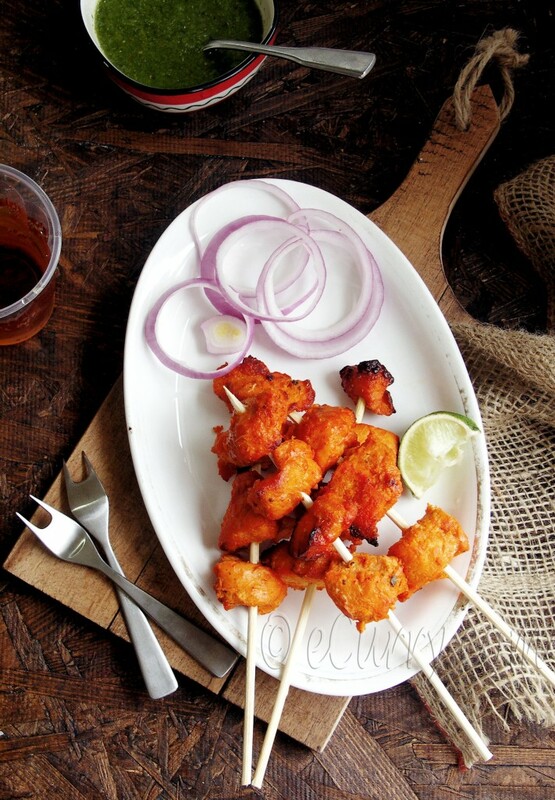 This is the best murgh tikka recipe on the net! THANK YOU! I made tikka for the first time today and it came out really well. Thank you for the yummy recipe !!! I want to make this tomorrow, it looks immense, I just have one question. When you have the final marinade and you say to add it to the bowl with the chicken, are you adding this to the original marinade or have you taken the chicken out of that marinade and then put it into the new one. Hi, I am making this next week. You mention adding saffron to the milk, but it dies not say how much saffron. Can you let know, or can I just skip this part. It mentions in the ingredient list to add a pinch of saffron. I know that could be wide range depending on the “pinch”. but more could not hurt.You can skip it too. 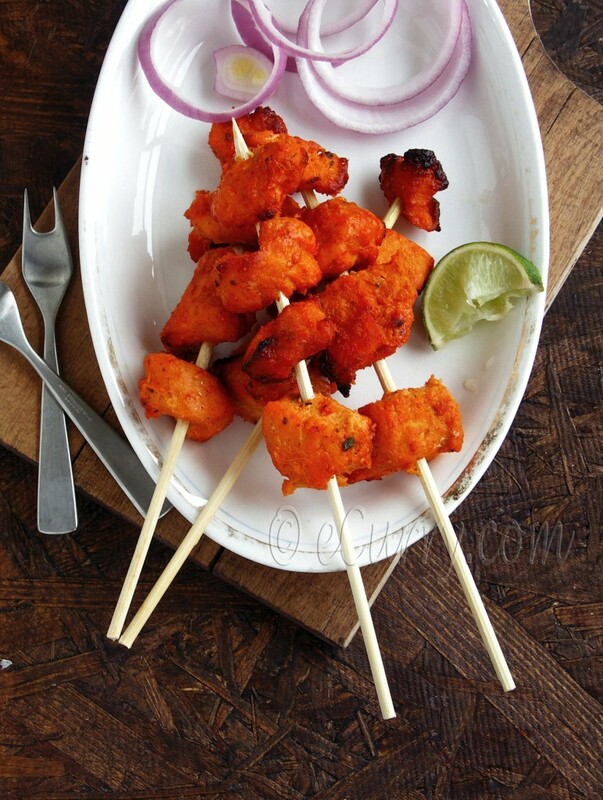 It does add a nice subtle flavor and some color, but Chicken Tikka can be made without safforn. 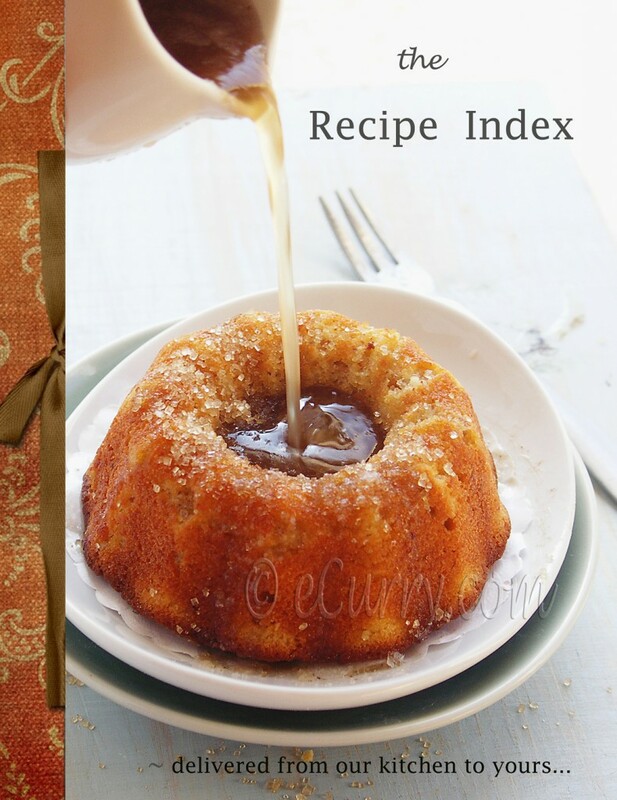 A really nice recipe, a true yummy!